Royal Caribbean is celebrating its 50th anniversary this year, and already some of the festivities are underway. 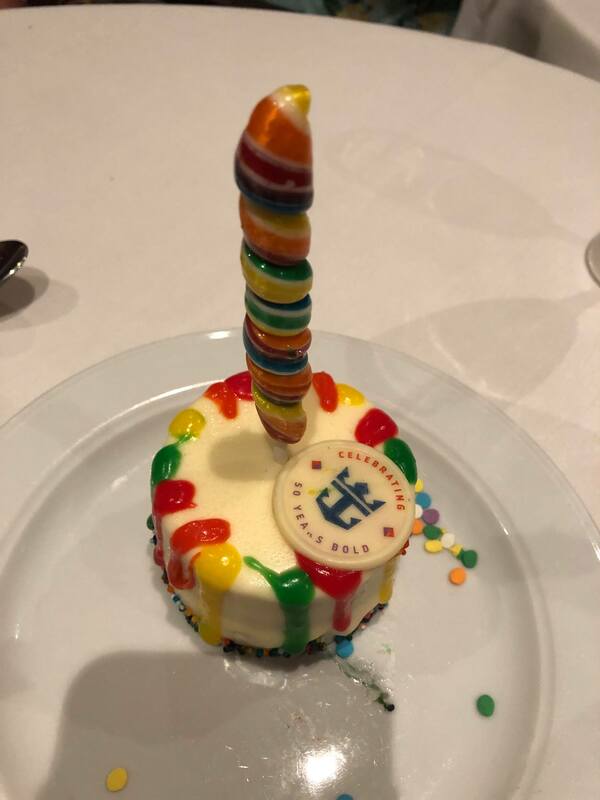 No birthday celebration is complete without a little cake! Royal Caribbean offers its guests two choices for enjoying dinner in the main dining room: My Time Dining or Traditional Dining. 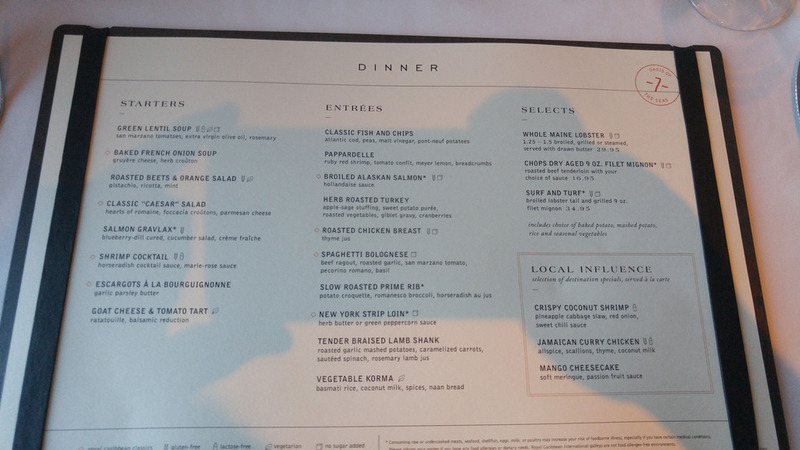 Each option allows for a style of meal aimed at the individual cruiser's preference and if you are wondering if My Time Dining is a better choice or if traditional dining is the way to go, then this blog post should help sort it all out. Traditional dining is an option for dinner where you choose between an early or late seating (sometimes referred to as "first seating" or "second seating"). In traditional dining, you are assigned the same table to dine at for each evening of your cruise and you will have the same dining time, table mates, and wait staff for each evening of the cruse. In some cases, you may be seated with other guests from the cruise (especially if you are traveling in a smaller group). Personalized waiter service: Since you will have the same wait staff each evening, they will make an effort to get to know your habits. Evening show times are often scheduled around traditional dinner times. 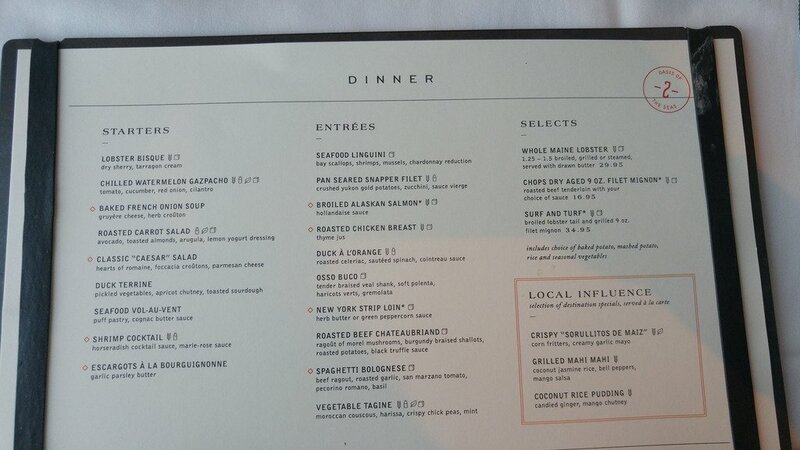 My Time Dining is a choice you have to have dinner at the Main Dining Room, where there is no assigned time or table. Rather, you have the choice of making reservations in advance or simply showing up and waiting for an available table. You can make reservations for My Time Dining either before the cruise on Royal Caribbean's site, or once you are on the ship. My Time Dining is a lot like dining out in your local town, where you can opt to call ahead and make a reservation or walk up to the restaurant and see what availability there is. Moreover, the flexibility in dining times means being able to eat dinner on your schedule. With flexibility comes responsibility, as it is up to you to make reservations when to dine. While you can show up and wait for a table, we highly recommend making reservations in advance to limit wait times. If you like, you can request the same wait staff each evening, but it may result in a longer wait for an available table. Greater choice of dining times: My Time Dinner is available each evening between the hours of 6:00 and 9:30 p.m.
Great for scheduling around shore excursion plans. Getting a table is simple for smaller groups. Less likely to be seated with other guests. Ultimately, the decision of which option is better will come down to your personal preferences, as well as some other factors related to your group. In a nutshell, My Time Dining offers greater flexibility in what time you eat, but there can be waits for to be seated. Sometimes the wait can be as long as 45 minutes during peak times. This can be mitigated by making reservations in advance, although for some people planning ahead defeats the point of My Time Dining to some extent. Traditional dining is a simpler approach to dinner in the main dining room since it requires very little work up front. Traditional dining requires you to adhere to one of two dining times, which may be too early or too late for your taste. Moreover, you may be seated with other guests and that has been hit or miss in terms of personalities clashing. Larger groups (more than six people) will find it significantly easier to stick with traditional dining so that they can have the same table assignment each evening. Getting larger groups seated near each other at the same time in My Time Dining is not a simple task. If you place a high priority on seeing the shows each evening onboard, you can go with both, but traditional dining times are usually already scheduled around the entertainment. Both My Time Dining and Traditional dining adhere to the main dining room dress codes each evening, which includes formal night. 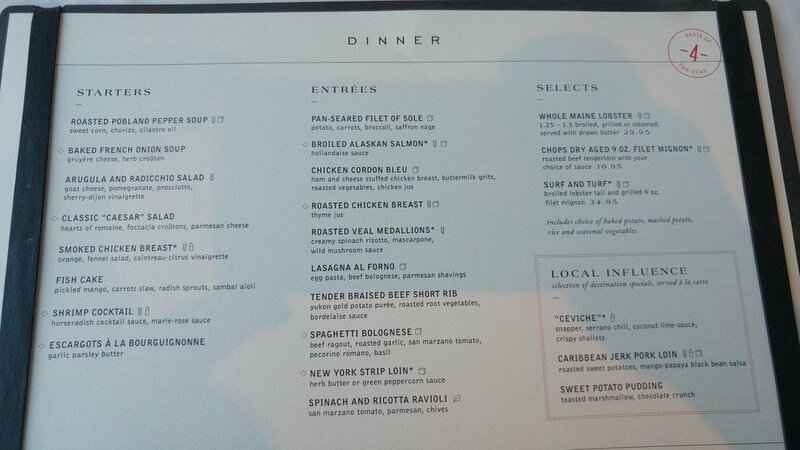 Which dinner option do you prefer? Is there an advantage to one over the other, in your opinion? Share your experiences and post your questions in the comments below. With ships around the world, Royal Caribbean welcomes guests from nearly every country. When it comes to dining, while their appetites and tastes differ, their expectations remain the same– fresh, delicious and authentic cuisine. Traveling chefs from across the fleet collaborate to perfect new menu items, but guest feedback ultimately determines which dishes make the cut. Every aspect of the ships’ main dining rooms, from the menu to the atmosphere to the service, sets the table for an unforgettable experience. 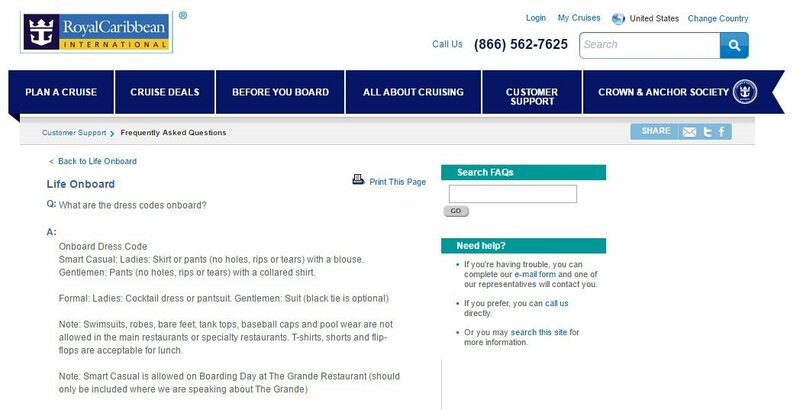 Royal Caribbean's website now lists shorts as one of the suggested forms of clothing to adhere to the cruise line's dress code while dining in the main dining room on casual nights. The website now describes casual night suggested attire as, "Jeans, shorts, tees, tank tops, polos, sundresses and blouses are all the right amount of laid back. Please keep swimwear to the Pool Deck." While the rule looks to be updated for casual nights, many guests have seen other guests dine in the main dining room wearing shorts on numerous occasions. Additionally, shorts we never saw shorts explicitly mentions as a prohibited article of clothing in the main dining room. It is unclear when the webpage was changed, but the good folks at the Internet WayBack Machine show the old version of this web page do not mention shorts, as of August 2016. 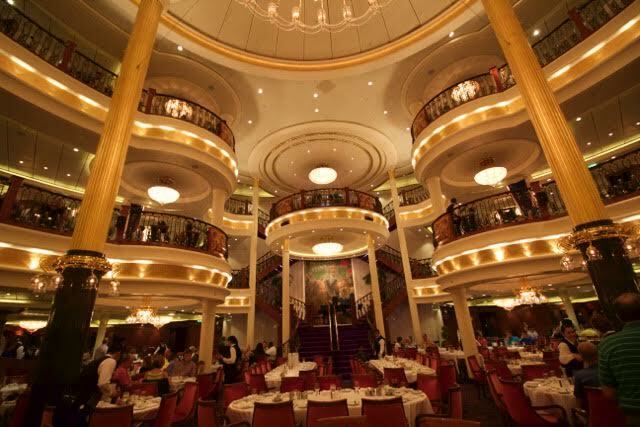 First time cruisers: Can I get a table for two people in the main dining room on my Royal Caribbean cruise? Royal Caribbean's main dining room is elegant, sophisticated and serves guests some amazing food. It is a staple of the cruise experience, but some guests do not love the idea of sitting with other guests at the same table. Whether you prefer some time alone at dinner, or just would prefer to sit at your own table, there are some options for getting a table for two on your next Royal Caribbean cruise. If you are in My Time Dining, tables for two are generally easy to get. If you do not arrange anything in advance, simply go up to the My Time Dining reservations table and when you make your dinner reservation, simply ask then for a table for two. It shouldn't be a problem, even if you don't have a reservation, although if it's a peak period, you might have to wait about 15 minutes. If you are in traditional dining, when you make your initial cruise reservation, you can request a table for two. You also send an email to rcldining@rccl.com about 2-3 weeks prior to your sailing with your request. This strategy usually works for most folks. Once onboard the ship, you can still make the request. On embarkation day, go to the main dining room and speak to the head waiter and ask for a table for two. They are usually quite accommodating. Read more about First time cruisers: Can I get a table for two people in the main dining room on my Royal Caribbean cruise? It looks like a new main dining room is available on Oasis of the Seas and that could potentially spread to other ships in the fleet. 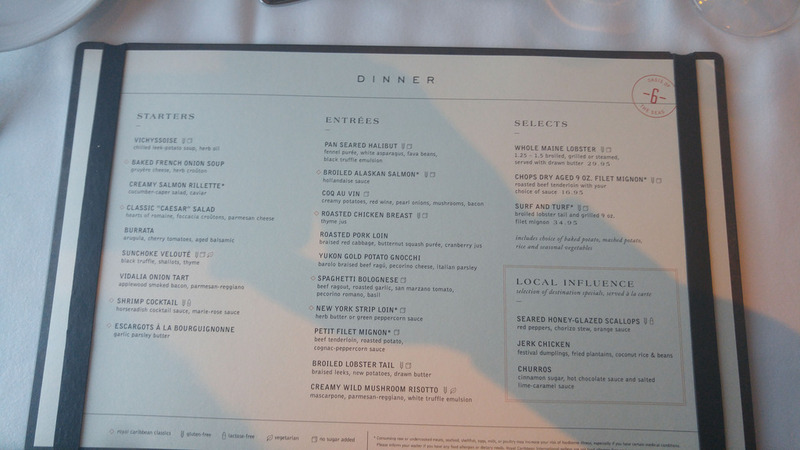 Cruise Critic member Eric Markson shared photos of the new menus from a recent sailing in which these new menus appeared. 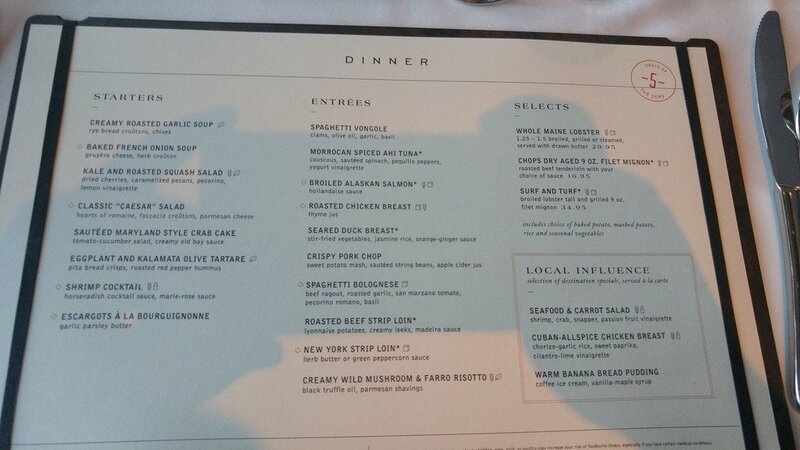 These menus are from nights two through seven of the cruise. 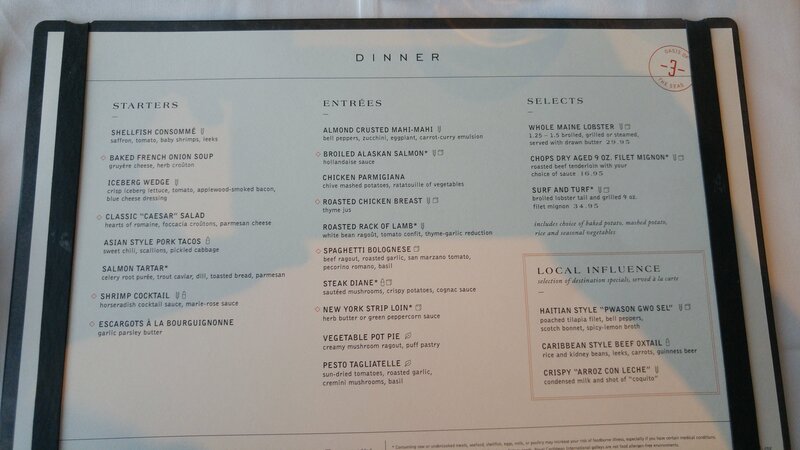 What do you think of the new menu on Oasis of the Seas? Please let us know with a comment!